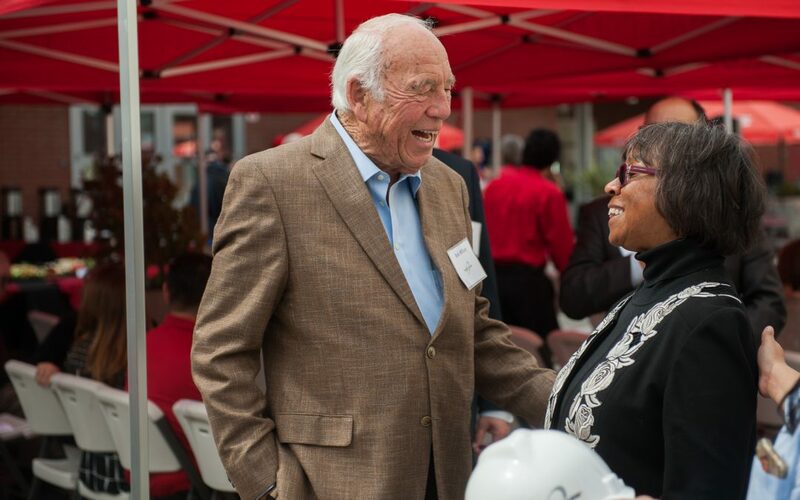 Pictured above: This year’s Comet Award recipient, Bob Wilson, talks to Palomar College Superintendent/President Dr. Joi Lin Blake at the groundbreaking of the Anita & Stan Maag Food & Nutrition Center in March 2018. Palomar College Foundation’s “Better Together” Community Showcase—a report to the community. The Palomar College Foundation looks back on a banner year, which saw the opening of two new education centers, a significant expansion of the Palomar Promise, a bigger and better Veterans Center, a new parking structure, high-profile keynote speakers, a variety of academic accolades and special events, and more. During the event, this year’s Comet Award will be presented to Bob Wilson, who donated the funding to create the Anita & Stan Maag Food and Nutrition Center in honor of his late best friend Stan, and his wife Anita. The Showcase will also feature a live drone demonstration. The event begins with networking and breakfast at 7:30 a.m., followed by the Community Showcase at 8 a.m. For more information, please visit www2.palomar.edu/pages/foundation/. Tickets to the Community Showcase cost $20 and are available online.